A critical edition of Brhadyogi-Yajnavalkya-Smrti prepared by Swami Kuvalayananda and Pandit Raghunathshastri Kokaje was for the first time published in 1951 by the Kaivalyadhama S. M. Y. M. Samiti, Lonavla. 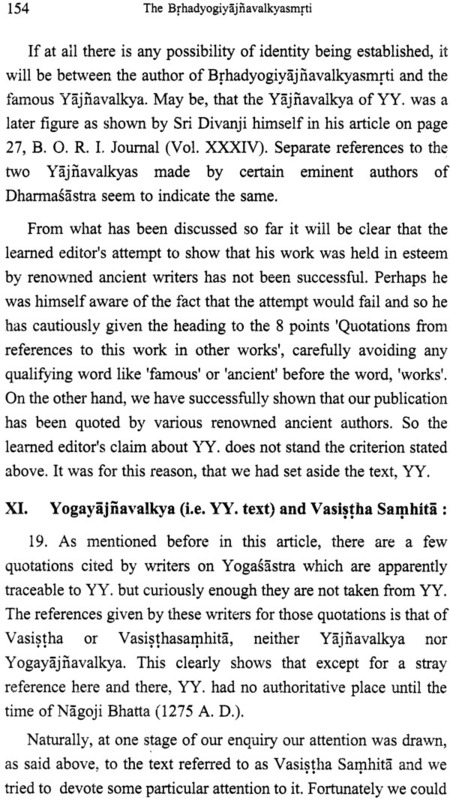 The entire text was in Sanskrit. 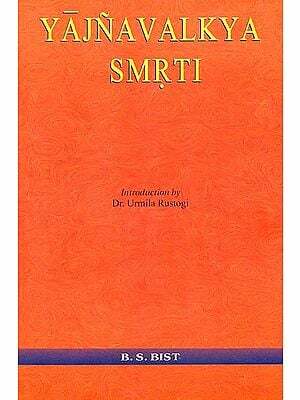 In 1976 a revised edition was published by the Kaivalyadhama S. M. Y. M. Samiti which was also in Sanskrit. 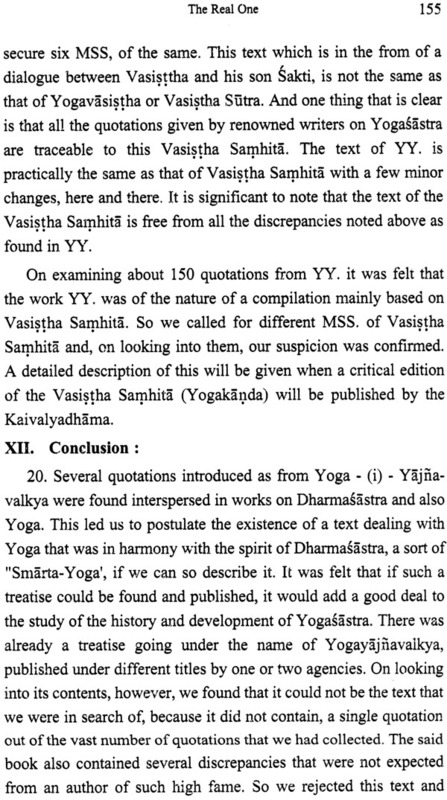 Looking to the importance of this text in the evolution and history of the developments in Yoga and the interest of the people in general in the study of Yoga, we had promised at the time of publication of the revised second edition that the English edition of the text would soon be brought out. We are happy to fulfill our promise by presenting to the readers this English edition of the Brhadyogi-Yajnyavalkya Smrti. 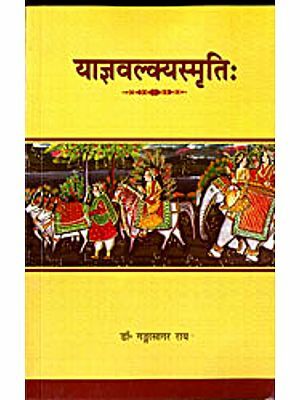 This edition has been made more useful not only by mere translation but also by addition of Glossary of important terms, index and a reproduction of the original article by Swami Kuvalayananda and Raghunathshastri Kokaje, the editors of the Sanskrit critical edition, high - lighting the circumstances behind the search of the manuscript, salient features, controversy on the originality raised by Shri P. C. Diwanji and clear-cut reply to the objections raised. We hope that the readers will appreciate our efforts. Description of Yajnavalkya - Questions of Rsi - Promise of reply by Yajnavalkya - Purpose of knowledge of Arsachanda etc. - Negligible result due to the ignorance about Arsachanda etc. - Dignity of the knower of Arsachanda etc. - Characteristics of Arsaka - Etymology of Chanda and pada - Characteristics of Daivata - Characteristics of application - Characteristics of Brahmana - Necessity of recollecting the Arsa etc. 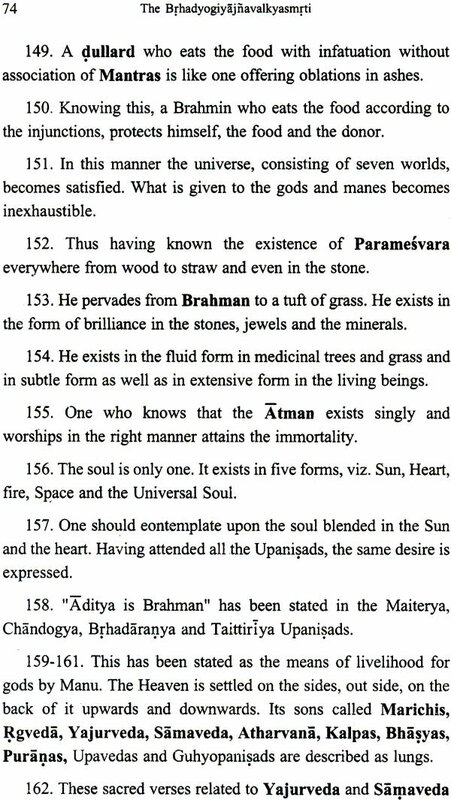 Pranava as Primordial Mantra - Importance of Pravava - Arsadi of Pranava - Application of Pranava in the beginning of all rituals - Matras of Pranava - Threefold nature of Brahman - Doctrine of Pasupatasamkhya - Three syllables of Pranava - Eulogy of Pranava - Synonyms of Pranava - Etymology of various synonyms of Pranava - Syllabic formation of Pranava - Effect of Pranava during death - Importance of Pranava - Pranava representing Isvara in the Supreme Being - Result of Pranava adoration - Difference in Sabdabrahman and Parabrahman Fivefold characteristics of Pranava - Adoration of Pranava-Importance of Pranava, Pranayama, Satya and Savitri - Result of Pranava, Vyahrti and Gayatri worship - Different views about Pranava - Views of Hiranyagarbhas, Kapila, Apantaratama, Sanatkumara, Brahmistha, Pasupata, Pancaratra and Vathuli - Conclusion of different views - Nature of Visnu - Ten names of Omkara - Etymologies of the names of Omkara - Views of Baskala, Rucakayana, Narada, Maudgalya, Vasistha, Manu, Parasara, Yajnavalkya and Brahmacintaka about the Matras of Pranava - Nature of the Omkara-Worship - Significance of Pranava - Outcome of the knowledge of Pranava - Conclusion on the narration of Omkara. 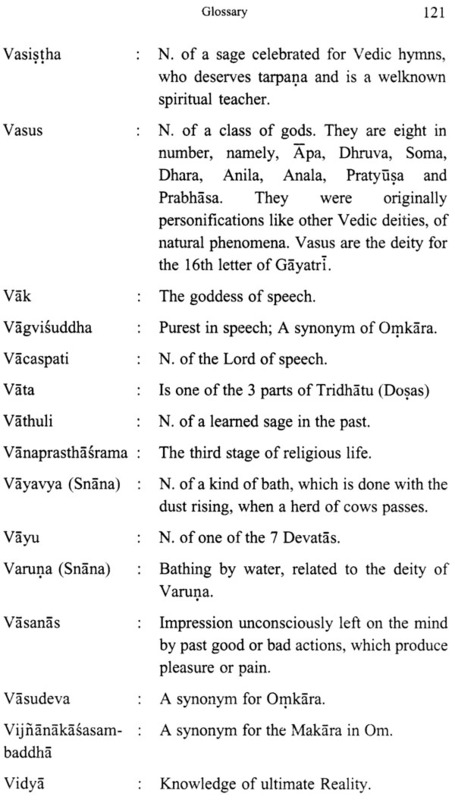 Vyahrtis - Difference of opinion about the number of Vyahrtis Vyahrtis - Etymology of the word Vyahrti - Results of the recollecting of Vyahrtis, Rsi, Chandas, Devata and application of Vyahrtis - Description of seven Lokas referred to in Vyahrtis - Nature of the universe - Evolution and involution of the universe - Time of salvation of those, who reside in the universe - Utterance of Vyahrti at the time of death - Conclusion to the statement of Vyahrti. 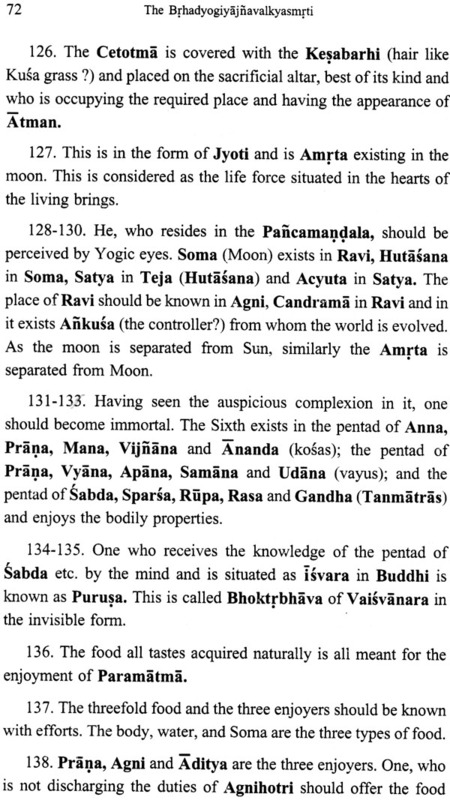 Introduction to Nyasa - Nyasa of the letters of Pranava - Nyasa of Vyahrti - Nyasa of Gayatri - Nyasa of Gayatri in different manner - Importance of the four Nyasas. Introduction to Sandhya - Importance of Sandhya - Description of three Sandhyas - Etymology of the word Sandhya - Sandhya without water - Time of performing Sandhya - Number of baths according to the Asrama condition - Alternative to bath in case of inability - Purposes of bathing and sprinkling of water - Questions of Rsis pertaining to bath. Request of Rsi and Yajnavalkya's narration about bath - Material for the performance of bath - Bathing procedure - Washing of the different parts of the body - A bow to the waters - Contemplation of a particular 'Tirtha' at the time of bathing Application of mud to the body - Application of cowdung which bathing with water - Sprinkling of water with the recitation of Varuna mantras - Purification with Darbhas - Japa in the water - Contemplation of Visnu in the water - Etymology of the word Narayana - Eulogy of the contemplation of Visnu - Vaisnavi Gayatri - Prohibitory action during bathing - Putting of squeezing clothes before Tarpana - Squeezing of clothes from right to left - Japa after the squeezing of clothes - Tarpana in water - Worshipping the Sun - Japayajna - Brahma-yajna - Tarpana of Deva, Rsi etc. - five Tirthas on the hand of a Brahmin - Substitutes of sesamum - Devatas of Tarpana - Iapa of Mantra - Rite of Pitrtarpana - Blame for the non-performance of Tarpana - Praise of bath, Tarpana and Sraddha - Mode of adoration of the deities - Offering oblation to Savitri - Looking at the Sun - Sun worship - Salutation to the deities-of directions - Offering of water to the deities like Brahma etc. 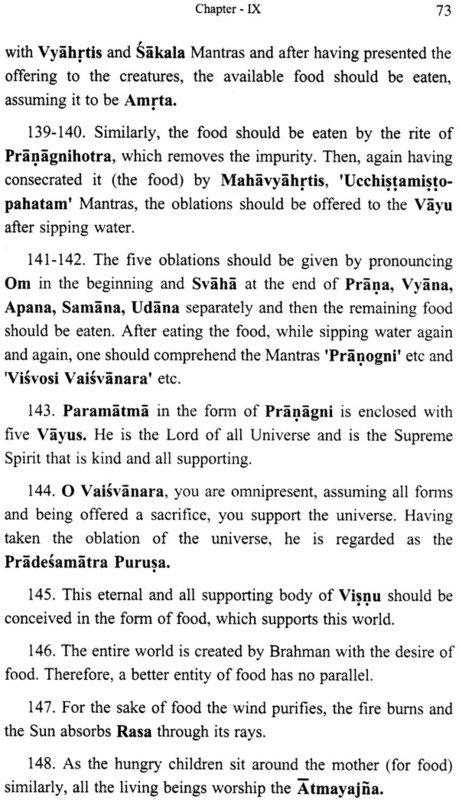 accompanied by salutations - Mantra of Tirthavimocana - Dedicating the Japa and washing the holy seat before going home - Beginning and end of bathing procedure - Special ritual of bathing in other's pond - Purification of a person wearing shoes - Nature of water to be used or sprinkling - Characteristics of the utensils - Speciality of bath and offerings in the rivers - Blame regarding bath, Japa, offerings and eating - Necessity of performing bath, Homa, Japa etc. - Result of bathing, offering, Japa, meditation etc. 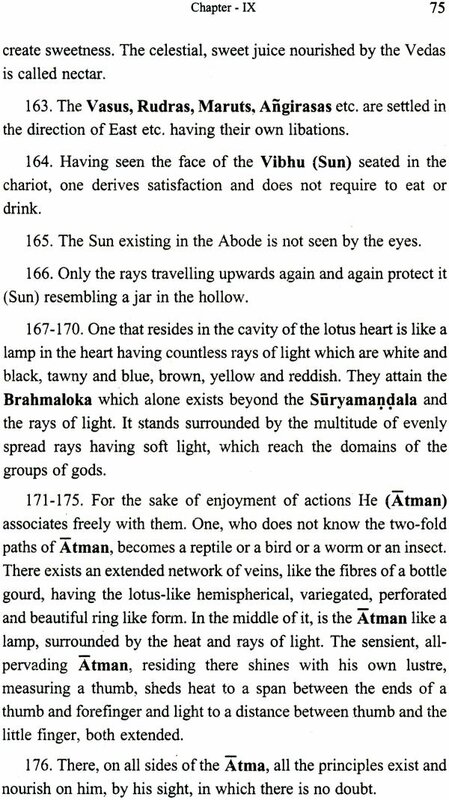 - Narration of the process of Japa - Eulogy of Japayajna - Exclusions at the time of Japa - Actions giving unlimited results - Three ways of Japa - Results due to the use of different rosaries - Varieties of rosaries - Place of Japa - Food to be taken during the period of Japa - Restrictions at the time o Japa -Water undesirable for bath - Particulars about bathing procedure or different Varnas - Importance of Yamas and Niyamas - Conclusion of the narration of bathing process - Seven types of bath - Alternative to bath for the weak - Rsi etc. of Aghamarsana Sukta - Significance of Aghamarsana sukta - Process of Sandhyopasana - Recommendation of Pranayama for internal purification. Introduction to Pranayama - Pratyahara and Dhyana - Characteristics of Pranayama - Mantras in Pranayama - Varieties of Pranayama - Pranayama as advocated by Manu - Nature of Matras in Pranayama - Nature of Atimatra (Intensive) Pranayama - Process of counting matras when holding the breath - Characteristics of Puraka Pranayama - Nature of Kumbhaka Characteristics of Recaka Pranayama - Characteristics of Puraka - Kumbhaka - Recaka -Concentrating on different deities at various parts of the body during Puraka, Kumbhaka and Recaka - Results of Pranayama - Sipping water after Pranayama - Etymology of the word Acamana - Pranayama according to Siddhanta - Process of Pranayama - Introduction to Pratyahara - Characteristics of Pratyahara - Process of Pratyahara - Results of Pratyahara. Introduction to Dhyana - The process of Dhyana - Vibratory and non-vibratory nature of Omkara - Nature of Jiva - Attainment of highest ideal by the combination of Jnana and Karma - Necessity of Dhyana - Denouncing the renouncement of Karma due to the fear of bodily affliction - Astangayoga and its results - Significance of Atmopasana - Importance of Savitri Upasana - Meaning of Gayatri Mantra - Element of Bharga - Etymology of the synonyms of the Surya - Origin of the universe from Hiranyagarbha - Synonyms of the Surya - Etymology of the synonyms of the Sun - Description of special Nadis - Etymology of the word Hamsa - Characteristics of the Purusa in the fire element - Process of Agnihoma and its results similar to Agnihotra - Atmopasana by the Yogic way - Nature of the Purusa - Description of the three types of food - Three enjoyers of food - Process of Pranagnihotra - Result of Atmopasana - Fivefold nature of Atma - Atmopasana as advocated in the Upanisads - Approval of Manu for it - Description of the two paths - Place of Atman in the body - Form and measure of Atman - Result of Atmacinatana - Characteristics, process and importance of Dhyana - Dharana - Characteristics of Yogasiddhi - Attainment of immortality through Yoga. 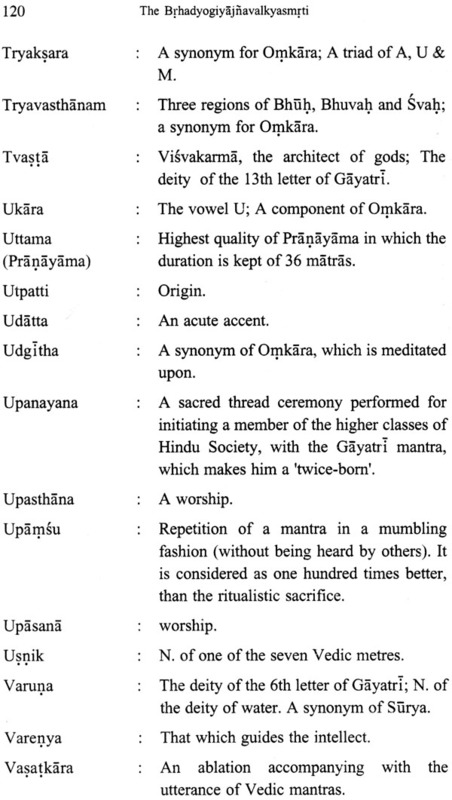 Introduction to Suryopasthana - Daily rituals - Mantras of Upasthana -Practicable of Gayatrijapa - Result of Gayatrijapa and Sandhya - Importance of Japayajna - Result of the Japa of Omkara, etc. 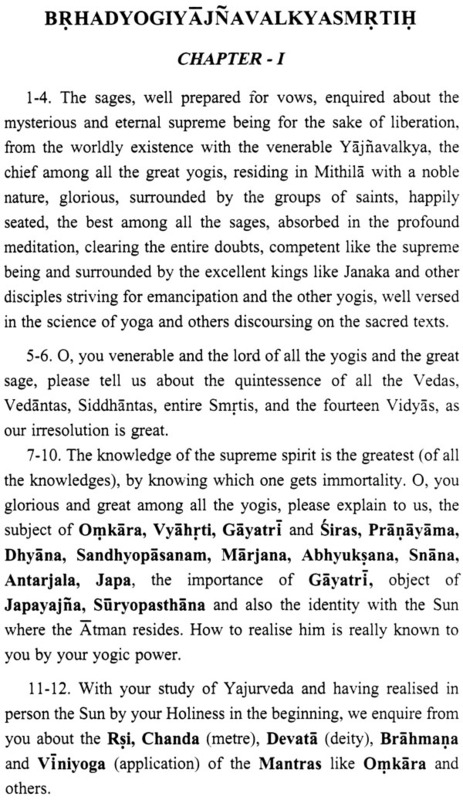 Importance of Yogadharma - Characteristics of the person well-versed in Vedas - Characteristics of the subjugator of the senses - Praise about the study of the Vedas - Two aspects of the Brahman - Nature of three Vedas - Concept of Sthula and Suksma Brahman - Results of the study of the Vedas - Praise of combination of Jnana and Karma - Praise of attaining the Atmadarsana by the Yoga - Two kinds of all Vedic rituals - Nature of Pravrtta Karma and Nivrtta Karma - Results of the two kinds of Vedic rituals - Praise of Karma Yoga - Importance of Dhyanayoga - Why to the knowledge of Paramapurusa - Synonyms of Paramapurusa. Importance of Vedic scriptures - Purpose of composing scriptures by the Rsis - Fourteen Vidyas - Atipramanani (scriptures) - Authors of Samkhya etc. Disciplines not approved by the Vedas - Greatness of Manu - Praise of the study of the Vedas - Denouncing Smrtis excluded from Vedas - Lost branches of Vedas and other extant works as the basis of Smrtis - Importance of Sruti and Smrti - Condemnation of the Science of dialectics which does not believe in Vedas - Importance of the study of Vedic scriptures - Results of Atmopasana - Narration of the contents stated in this Smrti - Results of the study of this Smrti - Qualifications of the person studying this Smrti.